I’m a numbers nerd and am always looking for good crowdfunding statistics and statistics behind crowdfunding success. 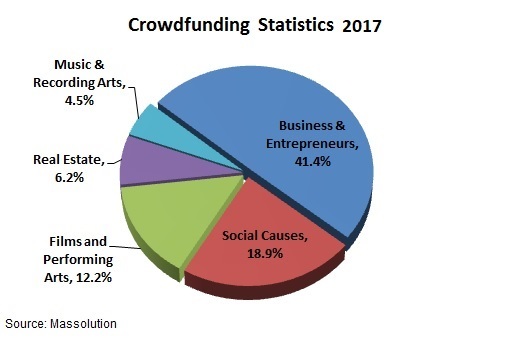 Crowdfunding statistics show a clear trend in the number of small businesses and non-profits going online to tap the crowd for their preferred source of funding. Growth in crowdfunding and peer lending is exploding and quickly transitioning from ‘alternative’ funding source to the mainstream. While general crowdfunding statistics show huge overall growth, I found an infographic recently that does a great job of breaking down the numbers and what it takes to successfully raise money from the crowd. Even if you’re not into stats like I am, it’s hard to ignore what crowdfunding can do for your business or social cause. It’s not just about raising money anymore but about tapping a huge community of supporters. 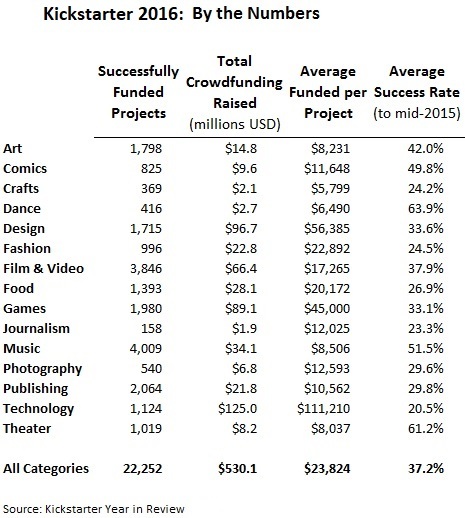 Kickstarter crowdfunding statistics show more than 22,000 projects were successfully funding last year. Film & Video and Music far exceeded all others in terms of successful projects but the Technology and Design categories raised more money per project. More than 3.3 million people around the world backed a project on Kickstarter last year of which 2.2 million were new backers. More than $1.9 billion has been raised on Kickstarter as of mid-2015 with a success rate of 37% across all projects. One of the most exciting developments in crowdfunding is increased support for research science. Nick Dragojlovic of Fundedscience follows the crowdfunding statistics on supported scientific campaigns and how the two fields are merging. Crowdfunding research science is relatively new but already thousands of projects have been successfully funded on internal university websites and crowdfunding platforms. Studying campaigns launched on university crowdfunding sites, Nick found an average raise of $6,228 for successful projects. As crowdfunding for research science expands, the potential to unlock new cures and research could be huge. Crowdfunding platform GoGetFunding released an excellent infographic on the crowdfunding statistics behind successful campaigns. The platform looked at more than 12,000 crowdfunding campaigns to put together the numbers in the graphic. Some of what they found surprised even me and I’ve been reviewing and coaching small business startups for years. Keep your community active. Campaigns that updated followers regularly raised 126% more than those with no updates. Keep people up-to-date and they’ll stay involved. Check out our previous post on communicating with your supporters for building community in crowdfunding. Teams raise 38% more than one-person campaigns. This is something we’ve talked about on the blog before. The campaign may be your dream but that doesn’t mean you should go it alone. Teams bring different skills and perspectives besides just helping to take some of the workload off your shoulders. Crowdfunding campaigns with personal videos raised 105% more than those without. Frequent readers are probably tired of me saying it but, You need a video and YOU need to be in it. Check out our post on making your crowdfunding campaign personal to make an impact. Campaigns with a day-to-day marketing plan raise almost three times as much! This is a great idea. Your daily to-do list doesn’t have to be earth shattering but plan on doing at least one thing each day to promote your campaign. Check out our post on how to get the best bang for your crowdfunding marketing strategy. Successful campaigns set a sense of urgency by a shorter time period, between 20 and 40 days. Most campaigns start out and end with a lot of activity but see momentum drop during the middle of fundraising. You really are not missing out on much by shortening your campaign and it will create that urgency you need to get people going. While it’s true that most crowd campaigns fail to raise enough money, your chance of success increases dramatically with a process of pre-launch and outreach. The clear problem in statistics on failed campaigns is that crowdfunders don’t know what it takes to really build momentum and reach the crowd. Over years of consulting and running my own campaigns, I’ve put all 17 critical steps into one book – Step-by-Step Crowdfunding. An Amazon best-seller in both the crowdfunding and non-profits fundraising categories, the book guides you through each stage of a successful campaign. Crowdfunding statistics make it clear that crowdfunding and peer lending is quickly moving from ‘alternative’ financing to mainstream. With growth in funding and popular acceptance as a legitimate source, crowdfunding is quickly becoming the preferred way to raise money for business or personal projects. Crowdfunding is the evolution of social media and funding, and your way to build a community around your brand while you raise money. I can’t find a email, so I’ll reach out here. Had the dickens trying to get your book, finally went to amazon on a whim, there it was. your links don’t work on your book. Enough complaining – just wanted you to know. Love all your resources here. 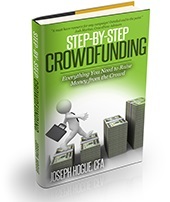 I’m looking to put together sources for people who want to use crowdfunding – you have one to the best. I would love to interview you for my audience. I would also like to get your input on a new crowdfunding platform called, “Smashfund”. Email jhogue@crowd101.com for the interview, glad to participate. I’ll check the links to the book. The one on the crowdfunding eBook page works but will need to check the others. Thanks for the heads up.